Last week was a terrible week as far as remembering to take these dang selfies goes and also I wore sweatpants and yoga pants lots. Oops. 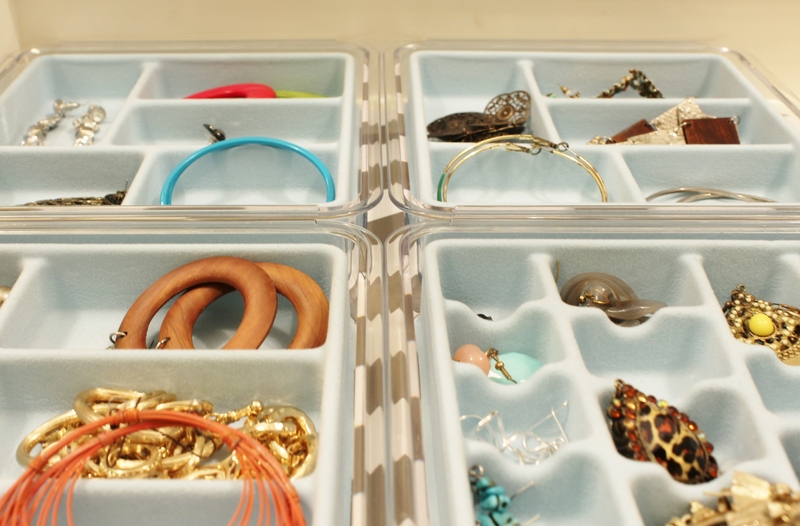 Most of my earrings and a few bracelets are organized by these stackable organizers from The Container Store aka Heaven. I’ve lined this drawer that is part of a built in that we had installed in our closet prior to moving in. There is a bit more space to the right of this that is currently empty. I plan on purchasing a couple more smaller sized similar versions for more earrings and rings- there isn’t quite enough room for two more of the same size as these or I would just get the exact same. 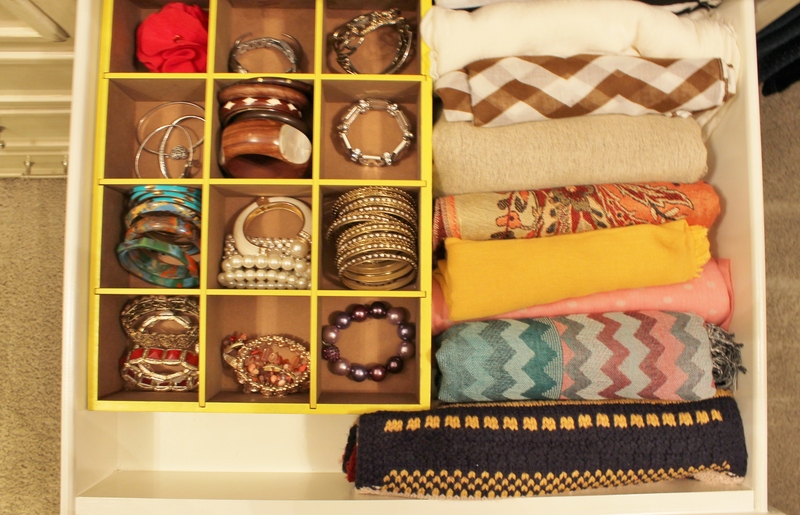 The next drawer down contains most of my bracelets and my scarves. I found this organizer, which is meant to hang on the wall and house little knickknacks and things, at Big Lots a few years ago and then one day a few months ago it occurred to me that it would fit my bracelets perfectly! And it did! I does need a paint job, though, so one day I will bust out the spray paint (Dang, I love to spray paint stuff, ya’ll!) and paint ‘er up. I bought this organizer, which I believe is meant for belts, at The Container Store as well. 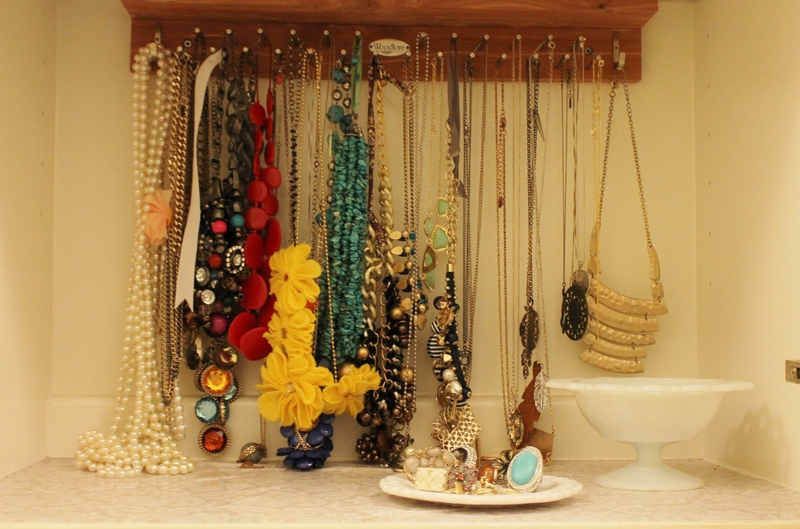 You can see I need more space to hang my necklaces from, and there is room on the left and the right for some hooks or something similar, so I think I will have to get that handled soon. I really love necklaces. I rarely leave the house without one on. It is made of cedar and when I first bought it my closet smelt divine! I associate the smell of cedar with my Grandpa. When I was a little girl he ran a lumbar yard that ALWAYS smelt like cedar, and its been a favorite smell of mine ever since. The little milk glass dish contains some earrings and the ceramic dish holds my rings. This is my side of the upper cabinet half of the closet built in. I found these canvas baskets super cheap at At Home (formerly Garden Ridge). The pattern has a gold metallic shimmer to it in person, which I love. They house my belts, brassieres, shirts that are too small, etc. 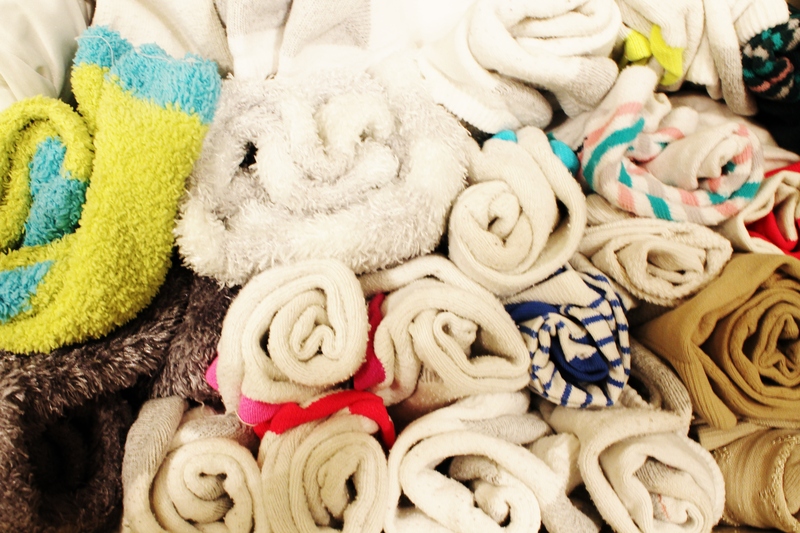 Here’s a tip for folding socks: don’t fold them! I just roll them together so they don’t get stretched out from tucking one into the other. I have considered getting a sock organizer but this drawer is very large and also house other items. I’m sure there’s something out there that would work for me, I just need to look closely the next time I’m in The Container Store. Ok I think I have just given myself enough excuses to make a trip there soon. Yay! The husband’s side of the cabinet. The baskets work great to hold his pajamas, workout clothes, hats, and shorts. This is most of my husbands tee shirt collection. 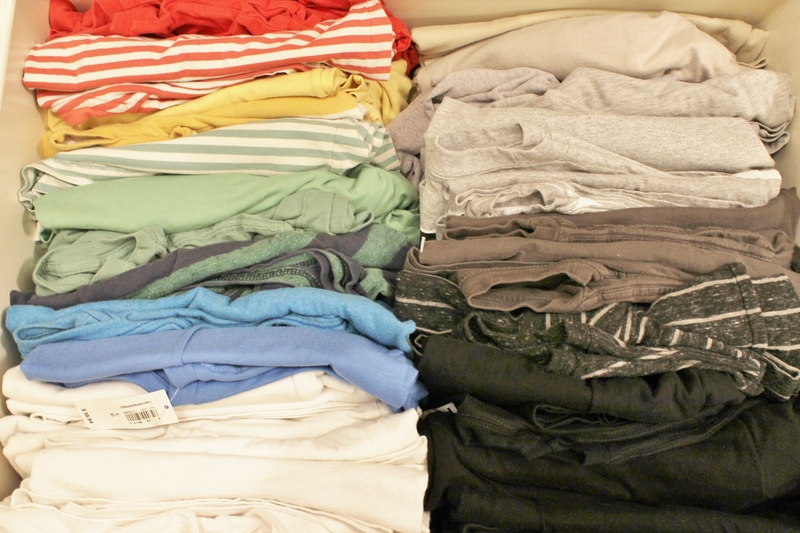 I fold them and then file them in the drawer vertically to best utilize the deeper drawer. I do this with my tee shirts and pajamas as well. So there you have it! 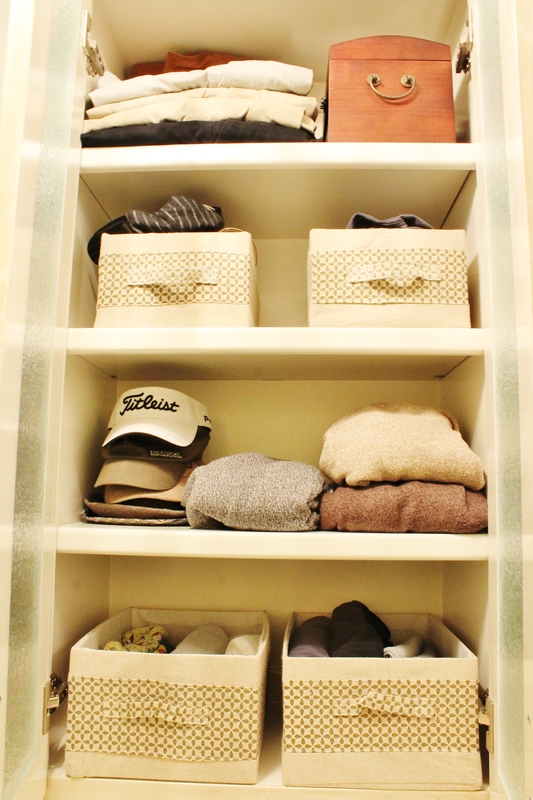 Closet organization is one of the most fun organization projects, in my opinion. 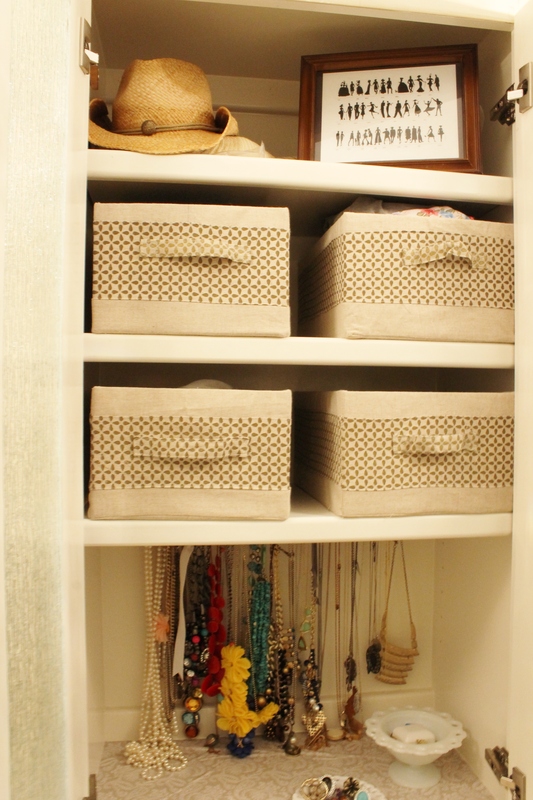 It’s just so useful to have an organized closet! It really saves you time in the long run. 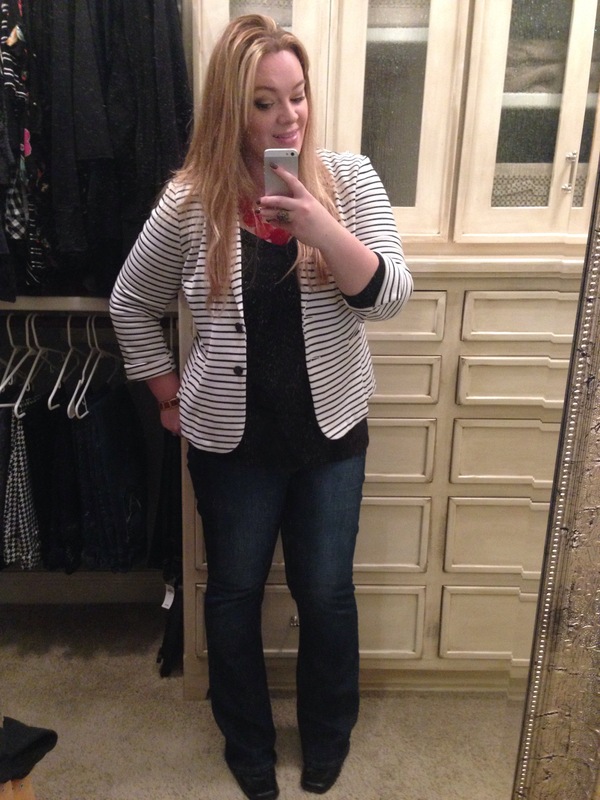 Urrrmagosh, I’m obsessed with your closet. Where is your outfit from today though?? SO CUTE! !